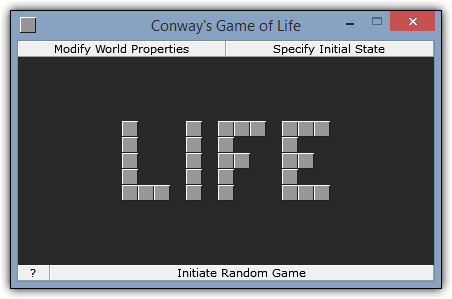 The only player input in Conway's Game of Life is in defining the "initial world state." You may choose a random state, by clicking "Initiate Random Game" or specify the initial world state by clicking the "Specify Initial State" button, both shown on the right. Furthermore, you may increase or decrease the world's dimensions by clicking the "Modify World Properties" button. The time between turns may be modified by changing the "Turn Speed" control. The values for this control range from 1 (slowest) to 60 (fastest).